Exhibition features diverse array of contemporary art competing in each category. For more information about GRAM's exhibition, ArtPrize 10 at GRAM, and related events visit artmuseumgr.org/artprize10. 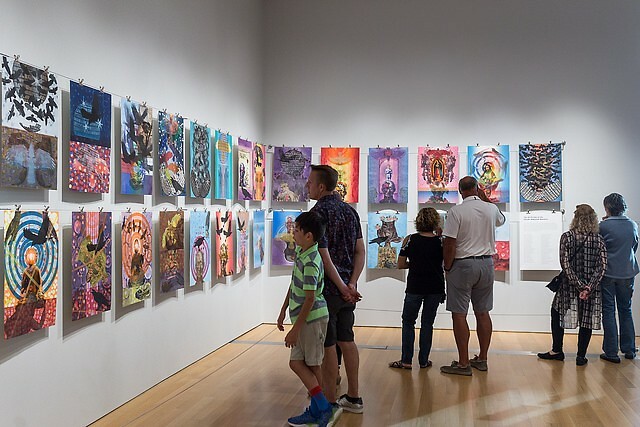 The Grand Rapids Art Museum (GRAM) presents ArtPrize 10 at GRAM, the exhibition showcases a broad range of contemporary art by local, regional, national, and international artists—competing in every ArtPrize category: 2D, 3D, Time-based, and Installation. ArtPrize 10 at GRAM is on view from September 14 - October 14, 2018. 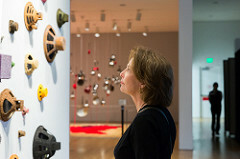 “Visitors to ArtPrize 10 at GRAM will find the Grand Rapids Art Museum's most ambitious presentation yet—dazzling installations adapted to interior and exterior public spaces, technology-based interactive experiences, monumental sculpture, and more," commented GRAM Director and CEO Dana Friis-Hansen. Several themes can be found within the artwork on view—Venezuelan artist, Saskia Jordá, uses her work as a call to action to end violence and hunger. Michigan-based artist John Gutsokey addresses loss, grief, and the aftermath of hate crimes, as well as gun violence, homophobia, violence against people of color and the transgender community, and LGBTQ rights. Arizona-based artist duo Lauren Strohacker and Kendra Sollars shed light on the displacement, reintroduction, and loss of wildlife in urban areas, and have collaborated with Blandford Nature Center to create their time-based entry, Animal Land. "The Grand Rapids Art Museum is delighted to present ten artists in ArtPrize 10 at GRAM," said GRAM Chief Curator Ron Platt. "The artists in the exhibition are grappling with urgent social issues and the current state of public and private discourse surrounding these issues—I look forward to seeing how our visitors will engage with the work on view." Back in its second year is the Museum’s participation in Pitch Night, an ArtPrize program through which participants in select cities compete for funding and the opportunity to exhibit their art at a high-profile venue. Nathaniel Lewis, winner of Pitch Night Phoenix, will install a thirteen-foot-long replica of a toy cap gun in the Museum's East Court. Lewis' 3D entry, Re:VOLVER, focuses on the intersection between play and action and asks the question: how do our childhood experiences shape who we become? Wall of Sound is an installation by the late William (Billy) R. Mayer, a sculptor and professor of art at Hope College in Holland. During his career, Mayer challenged his students to create art of excellent craftsmanship and real meaning, a combination he achieved in his own work. His work, comprised of colorful, handmade stereo speakers appears whimsical, yet it embodies more sober ideas about personal expression and identity. GRAM is proud to host three projects which have been awarded ArtPrize Artist Seed Grants. Mark Niskanen and Jani-Matti Salo’s No Names, Lauren Strohacker and Kendra Sollars’ Animal Land, and Saskia Jordá’s Cacerolazo were awarded $2,000 in grants presented by the Frey Foundation. The Grand Rapids Art Museum is one of the premiere ArtPrize venues in downtown Grand Rapids. Centrally located in the heart of the city, GRAM is known for hosting some of the strongest work in this international art competition; Public Vote Grand Prize winners in 2010, 2012, and 2014, Juried Grand Prize winner in 2014, Two Dimensional Juried Award in 2015, and the Time-Based Public Vote Award in 2016. GRAM was also shortlisted for the honor of Best Venue in 2013 and 2014. About ArtPrize: ArtPrize is an open, independently organized international art competition in Grand Rapids, Michigan. It is a 501(c)(3) non-profit organization. More than five hundred thousand dollars in prizes have been awarded each year, which include a $200,000 prize awarded entirely by public vote and another $200,000 prize awarded by a jury of art experts. Any artist working in any medium from anywhere in the world can participate. Art is exhibited throughout downtown Grand Rapids—museums, bars, public parks, restaurants, theaters, hotels, bridges, laundromats, auto body shops, vacant storefronts and office spaces. ArtPrize 10 will take place from September 19 - October 7, 2018. About the Grand Rapids Art Museum: Connecting people through art, creativity, and design. Established in the heart of downtown Grand Rapids, the Art Museum is internationally known for its distinguished design and LEED® Gold certified status. Established in 1910 as the Grand Rapids Art Association, GRAM has grown to include more than 5,000 works of art, including American and European 19th and 20th-century painting and sculpture and more than 3,000 works on paper. Embracing the city’s legacy as a leading center of design and manufacturing, GRAM has a growing collection in the area of design and modern craft. For hours and admission fees, call 616.831.1000 or visit artmuseumgr.org.